Next Thursday 8 th August at Old Parliament House Canberra over 100 Aboriginal males from around Australia will be there to help NACCHO launch its Aboriginal Male Health 10 point Blueprint 2013-2030, and sitting in the audience will be Jordan Lovegrove (pictured above) who has been busy all this week in Adelaide designing the NACCHO Blueprint brochure. With the Blueprint all about “Aboriginal male Healthy futures for generational change” Jordan is really what the strategy is all about and below we highlight his journey for change. 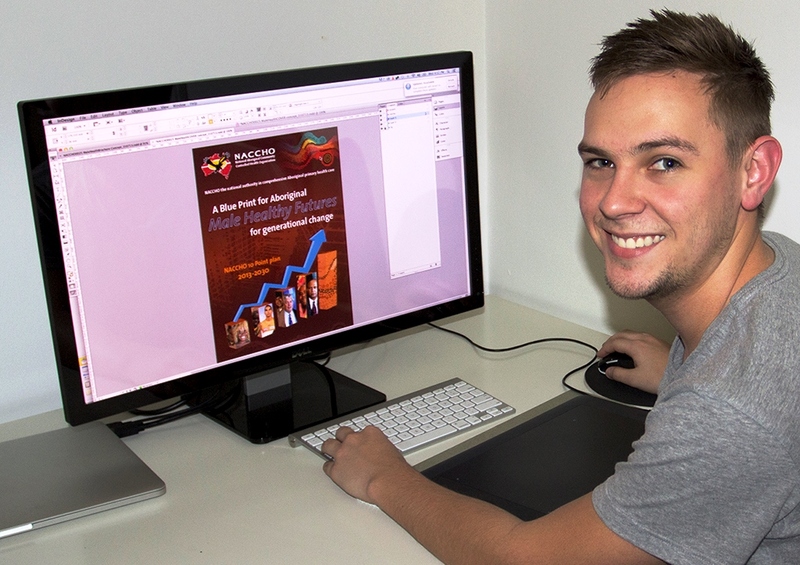 Jordan Lovegrove is a Ngarrindjeri young man and one of Dreamtime Public Relations’ talented graphic designers. He has hand-drawn art on the computer for various organisations around Australia, designed many print and promotional merchandise items, and built various websites. Whilst completing Year 12, Jordan knew he wanted a career in design and website development. Dreamtime PR employed him as an Apprentice and he has since completed his Apprenticeship in 18 months instead of 3 years. Due to these outstanding results, Jordan has been nominated for National Apprentice of the Year and is currently a Finalist in the DFEEST 2013 SA Training Awards. Since joining Dreamtime PR, Jordan has also participated in FaHCSIA’s National Indigenous Leadership Program 2011-12, attended Dynamic Web Training in Melbourne, enjoyed art development training from a local Elder, and undertaken various other on-the-job training activities. Jordan is one of Dreamtime PR’s ‘star’ Indigenous trainees and is a valuable contributor to projects across Australia which are addressing the inequality of Aboriginal and Torres Strait Islander people nationwide. Dreamtime PR’s MD, Janet Craig, is very proud of Jordan and is looking forward to promoting him to a role in the near future where he will train other Indigenous trainees like himself. Can I please get a copy of the blueprint. I am trying to faciliate the .inister’s involvement and this will be handy.